Kim Poole, Kelley Settles and Sheroes Sisterhood storm Kumasi with Hairtage. Sheroes sisterhood- a network of sisters that span from USA to Gambia, Senegal, Ghana and other nations in Africa led by sensational Soul Fusion Artist Kim Poole and featuring Kelley Settles a social photographer also based in USA will be having their mentoring and capacity development event taggedHAIRTAGE : Connecting our root, combing through our culture at the Golden Tulip Hotel Kumasi on Friday 9th of March 2018 . The Hairtage event taking place tomorrow evening will include workshop on perfecting the act in using natural products, Kelley Settles the renowned social photographer will exhibit her pictures collected in over a decade on hairstyles and head sculptures from different cultures and nations at the occasion. Kim Poole a renowned community activist, who uses her art, music, as an organizing tool through her Teaching Artist Workshops and the Teaching Artist Institute which was officially founded in 2015 will lead the discussion on the important connections in our scalp roots that connects us all. 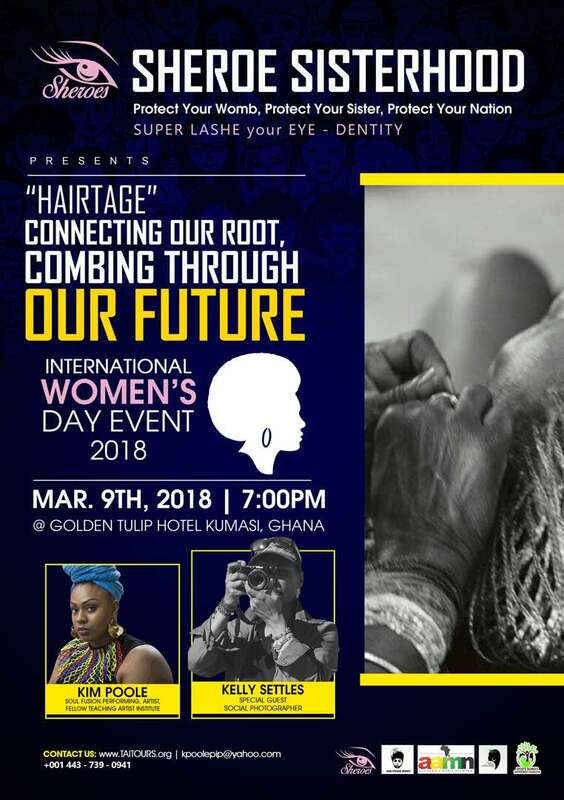 Ghanaian stylists will also showcase contemporary hair styles and demonstrate the evolution of hair styling in this century. 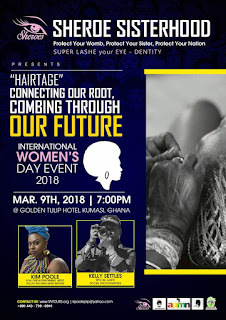 The Hairtage event is certified to be an exhilarating experience for its attendees and is special because is geared towards marking the 2018 International women's day celebration in Ghana. The event media partners includes All Africa Media Network .